ප්‍රේමදාස ජනපතිවරයාගේ උපන් දිනයට සියක් නමක් පැවිදි කරවීමේ මහා පුණ්‍යොත්සවයක් සූදානම් කරන ලදි. මේ සඳහා සිරිසේන කුරේ ආමාත්‍යවරයාගේ සහයෙන් කොළඹ මහ නගර සභාවේ කම්කරුවන් සහ වැඩ සුපවයිසර්වරු පිරිසක් තෝරාගෙන ඔවුනට සිවුරු පොරවා කැමරාව ඉදිරියේ මහණ කරන ලදි. අහේතුවකට මෙන් මෙසේ තාවකලිකව ප්‍රදර්ශනයට මහණ කල වැඩ සුපවයිසර්වරයෙකු සාසනයේ රැඳුනේය​. 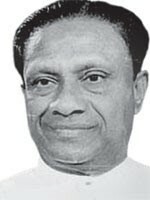 ඔහු තලල්ලේ උපාලි හිමියන් ලෙස ප්‍රසිද්ධ විය​. මාරයාගේ හෝරාව වෙබ් අඩවිය විසින් බොදුනුවන්ට කොකා පෙන්වූ නාටකය ගැන විස්තර අනාවරනය කරන්නේ මෙසේය​. …………….තලල්ලේ උපාලි මෙම පිරිසට හසුවන්නේ කොළඹ මහ නගර සභාවේ සිටය… ඒ වන විට නගර සභාවේ වැඩ පරීක්ෂකයකු වන ඔහු උපත ලැබූවේත්, හැදී වැඩුනේත්, කොළඹ ජනාකීර්ණ පෙදෙසක් වූ කොම්පඤ්ඤ වීදීයේය… ඒද සාමාන්‍ය සිංහල පරිසරයක් තුල නොව අති මහත් මුස්ලිම් බහුතරයක් මැදය… ඔහු උපතේ සිට මැදිවිය දක්වාම ඇසුරු කලේ මුස්ලිම් ජනයාය.. කතා කලේ දෙමළ බසය… කෑවේ බිවේ ඔවුන් සමඟය… ඉගෙන ගත්තේ ඔවුන් ඇසුරේය… කොටින්ම උපතින් හැර අන් සෑම අයුරින්ම ඔහු මුස්ලිම් ජාතිකයකු විය. ඒ වන විට විවහා වී දරුවන් දෙදෙනෙකුද සිටි උපාලිව මෙම පැවිදි කරවන ගොඩට කෙසේ හෝ අයත් විය. වැඩි කලක් සිවුරේ සිටිය යුතු නොවේ.. අදාල දිනයට කෙසේ හෝ සියක් නම පෙන්නුවාට පසු සිවුර තබා ගෙදර ගියත් ලොක්කාටවත් එය කරවන්නාටවත් ගැටළුවක් නොවේ.. අද වන විට සෑම දේශපාලක නායකයකු හා පක්ෂයක් විසින්ම කරනු ලබන කසිප්පු/සල්ලි හා බත් පැකට්ටුවට මැයි දිනයට සෙනග ගෙන ආ ක්‍රමය ආරම්භ කල අයට මෙම පැවිදි කිරීමත් ශාසනයේ උන්තිය නොව තම අංක සම්පූර්ණ කිරීමක් පමණක්ම විය. උත්සවාකාරයෙන් පැවිදි වූ අය දිනෙන් දින සිවුරු හැර පිටව යද්දි ඒ අතර සිටි කිහිප දෙනෙකු සාසනයේ රැඳිණි.. අද වන විට ඇතැම් විට එම සියයෙන් අනූනවයක්ම ආපසු ගොස් ඇතුවා වන්නටත් පුළුවන .. එහෙත් උපාලි හිමියන් මෙම ජීවිතයට හුරු විය. එයට හේතුව හරියටම මේ යැයි කිව නොහැක. ඇත්තෙන්ම ඔහුට සාසනයට විනාසයක් කිරීමේ උවමනාවක් ඇති බවක් දකින්නට නැත. එසේම සාසනයේ වැඩක් කරන්නටද උවමනාවක්ද නැත.. ඔහු මා හට හමු වූයේ 2004 වසරේදී පමණය.. ඒ වන විට ඔහු වසර 15කට ආසන්න කාලයක් සිවුරේ සිට ඇත. එම කාලය පුරාවටම ඔහුට පන්සිල් දීම වැනි සුළුම සාසනික සේවාවක්වත් පිහිටා නැත. අඩුම තරමේ දෙමළ ඌරුව නැතිව මිනිසුන් සමඟ කතා කිරීමටවත් නොහැක. සිංහලෙන් බැරිනං දෙමළින්වත් බණක් කියනවා තබා සිතීමටවත් බැරිය.. ඔහුගේ සාසන දිවිය සිවුරටත්.. කොස්සට හා ඉඳලටත් සීමා විණි. සාමාන්‍යයෙන් ගිහි අයකු පැවිදි කිරීමේදී එම තැනැත්තාට ආචාර්යයන් වහන්සේ නමක් සිටිය යුතුය… අප සාමාන්‍ය ව්‍යවහාරයේදී අහවල් හාමුදුරුවන්ගේ ලොකු හාමුදරුවෝ අසවල් හාමුදු‍රුවෝ යැයි කියන්නේ ඒ අනුවය… බොහෝ දෙනෙක් නොදන්නවා උනාට පැවිදි කිරීමකදී මෙන්ම උපසම්පදා කිරීමකදී තවත් වැඩිහිටි ධර්මධර විනයධර භික්ෂුවක් එයට සහභාගී කරවා ගනී… උපාධ්‍යායන් වහන්සේ යන නමින් හැඳින්වෙන මෙම තනතුර හුදෙක් නාමික තනතුරක් මෙන් පෙනුනද එහි ඇත්තෙන්ම ඉතා වැදගත්කමක් ඇත.මේ අනුව ඕනෑම භික්ෂුවකට ආචාර්යයන් වහන්සේ නමක් මෙන්ම උපාධ්‍යායන් වහන්සේ නමක්ද වෙයි. ඇතැම් විට පැවිදි වන විටත් නැතහොත් උපසම්පදාවේදී හෝ එසේ උපාධ්‍යායන් වහන්සේ නමක් හිමි වෙයි. මෙලෙස කරකවා අත​ඇරියාක් මෙන් සාසනයට පැමිණි උපාලි හිමියන් වකුගඩුවක් දන් දෙන්නට ගොස් නන්නත්තාර වූ බව මාරයාගේ හෝරාව වෙබ් අඩවිය වැඩිදුරටත් පවසයි. Due to the integrity of the writer, I believe this. How can a man with no principles lead a country? No wonder Premadasa got blown into pieces. Last week another writer gave his personal experience with Ranil and her husband Gonawala Sunil. MAGE MAWU BIMATA DEVIYAN PIHITAI. for CMC and personally knew cooray. He used to tell us how cooray get into his car in the morning, which had a Buddha statue and do the prayers and spent the day ordering execution of jvpers (all Buddhists). Sinhalese and Buddhism by these traitors’ mud slinging. Your last bit does NOT MAKE SENSE. Lets face FACTS without getting EMOTIONAL. In MR’s family, Buddhists are only 20%. His wife is a BAPTIZED CATHOLIC. All his kids studied at the country’s PREMIER CHRISTIAN SCHOOL (ANGLICAN) which is VERY RELUCTANT to take kids who are NOT BAPTIZED. I see NOTHING WRONG in that. I’m a Christian too. I’m glad MR visited the POPE MORE THAN ANY OTHER SL leader. Under MR we had the FIRST defence secretary of SL to visit the pope. My3’s family has 5 people. ALL Buddhists. NONE BAPTIZED or studied in MISSIONARY SCHOOLS. Even SWORDB is a born Christian (and died a Christian with a cross NOT around his neck but around his hip according to Dr PR Anthony). Another great patriot KADIRGAMAR was also a Christian. The madness in SL is TAMIL ELAM movement which is a HINDUSTAN funded movement. West also support it not to turn SL Christian but to make SL part of HINDUSTAN. My recollection is that Dayan Jayatilaka and Beruwala Muslim Bakeer Marker consider RPremadas as a hero. I do not know if RP was involved with digging for ancient treasures in old temples. I know two cases of dirty behavior. 1. When DB Wijetunga became PM Hema did not leave the Temple Trees and gave considerable, humiliating trouble to DBW. 2. A monk in USA told me how he was forced by threat of death to attend a RP some function, It must be this 100 monk factory celebration. 3. I also know that RP had money filled voting boxes which must be athe capital Sajith is using for donations now. 4. Another fact I know is that RP used a professor as his Guru and later that prof left country in fear of his death by RP!! 5. I know that KHJ Wijedasa called an officer who was going to get a govt house in Col 7 under long time occupation abd told him that Lokka is angry with him for not vacating the house. Apparently, all such govt baungalows were sold by RP with a big profit and cut back for him. So no wonder he died that way. If we are not going to reveal such incidents we know we are timid and selfish people. This entry was posted on Monday, November 30th, 2015. You can follow any responses to this entry through the RSS 2.0 feed. You can skip to the end and leave a response.